The Home Depot on Sunset Boulevard in Los Angeles used to be open 24 hours when I was at USC, and I found myself there at midnight several times during my college career. On one particular occasion, I think I was buying nails, the woman at the cash register was strangely dolled up. Her hair was neatly feathered, and she wore mascara and lipstick. But underneath all that, her features were mannish. And she had man hands. And though the name “Dolly” was garishly painted on her orange smock, it became obvious that Dolly was born a dude. In Samoa, there’s a vibrant subculture of individuals like Dolly referred to as fafafine. I never saw any in the village, but around Apia, it is not uncommon to see fafafine walking around town, working in retail, going about their business. I knew a few transgendered individuals in San Francisco, and many of them took hormones, which made the crossover much more authentic and convincing. Here, things seem to be more cosmetic; make-up, dresses, purses, etc., but nothing more than skin deep that I’m aware of. Given Samoa’s relative conservativeism, the societal acceptance of fafafine is a bit surprising, although “acceptance” may be too strong of a word. They are accepted in the sense that they are allowed to co-exist peacefully in urban Apia. More than that, there’s an annual Fafafine Pageant they show on TV, which I haven’t seen, but I’ve seen adverts. That said, their absence in the village leads me to think their cultural acceptance is tentative. I have heard that occasionally for whatever reason parents will raise a child to be a fafafine. 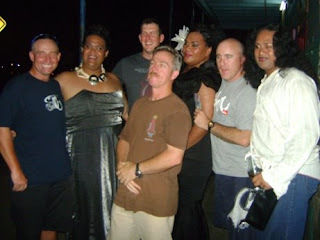 They will dress a boy like a girl and have him cook and clean while the other men head out to the maumaga. So perhaps its cultural roots explain their acceptance in an otherwise conservative society. 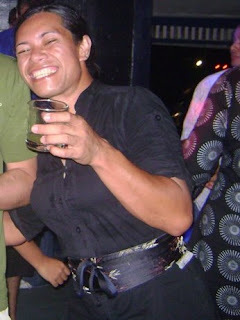 In Apia, fafafine is treated like a third gender, which allows for certain behaviours that would normally be taboo. Though I occasionally see it, boys and girls are not supposed to hold hands in public. But a girl holding hands with a fafafine seems to be okay. Homosexuality is not culturally acceptable, but the third-gender status allows for a guy/fafafine relationship to be considered something different than gay. That said, even guy/girl dating happens in the shadows, so it’s not like you see very many couples walking around anyway, let alone guys and fafafine. Also, by extension of the third gender rule and the no homosexuality rule, it is improper for a fafafine to date other fafafine. I was looking at postcards at a store in town, and I was a bit surprised to find one that had a picture of 3 fafafine with a caption on the back that read, “Fafafine: A playful part of life in Samoa.” I was impressed by that. In San Francisco, I don’t think I ever saw tourist kitsch that highlighted the “playful” aspect of the Castro district. In my social interactions with fafafine, I’ve found them to be respectful and polite. At clubs, I’ve been hit on in that same way I was occasionally hit on by gay men in San Francisco. It’s a weird blend of caution, humour, and euphemism. It’s flattering and easy enough to politely deflect. But I have yet to meet one who works at a hardware store. I hope things are well back home. Fafafine pictures below. Note: It was difficult to get pictures of fafafine because who wants to be the weirdo walking around taking pictures of transgendered strangers? Tourists from New Zealand (maybe?) and fafafine. 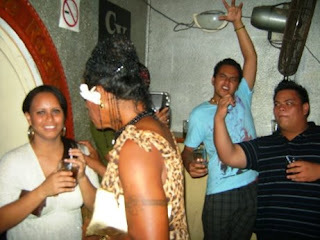 Random girl, fafafine, Samoan frat boys? Any chance you can help. I will be happy to send a nice postcard/s from Penang island. I realize that this is "tacky" but I will try anything, more or less. We treat everyone the same. When they are angry watch out!!! Have you heard the word "aunties". OMG! faafafige?? I do agree to what is said about underneath it all, its all mannish.. nothing different..lol, I still do not understand how faafige came to exist upon the earth? According to the Bible, the true word of God is that He created Adam and Eve, nothing else.. There was NEVER an Adam and Steve..ha ha ha.. I believe the influences of these two-faced people can greatly destroy many of our younger generations.. Im praying hard for these people to come to know that what they have become is totally FILTHY and UNACCEPTABLE to God. I can never forget back in the 1900s my hang out gangs were mostly faafafiges, they're full of jokes both good and bad, best entertainers to keep you entertained but WATCH out, they can turn into different masks.. LOL and they can disappear like a flash, after stealing anything that is not theirs.. thats how terrible they are.. Nice blog Matt. To the anonymous person above me... why cant we just accept people for who they are? If they want to be different, then let them.. Im just curious as to why it bothered you so much you just had to write something so close minded like that?? Hi Matt, just read this blog and I thought it was pretty balanced. I once read about this "third gender" on a plane heading home a few years back...I was pretty shocked. But meeting a few Samoans overseas, I asked the question about it all....pretty much "part of the parcel" in daily life.